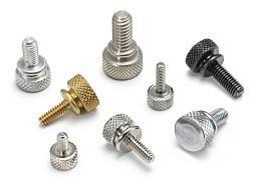 Knurled Thumb Screws are typically for use in applications where periodic manual adjustment is required and where finger pressure can supply sufficient tightening torque. These are available in aluminum, brass, steel and stainless steel. Parts can be plated in various different platings such as, black oxide, black zinc, bright brass or anodize for an additional charge.